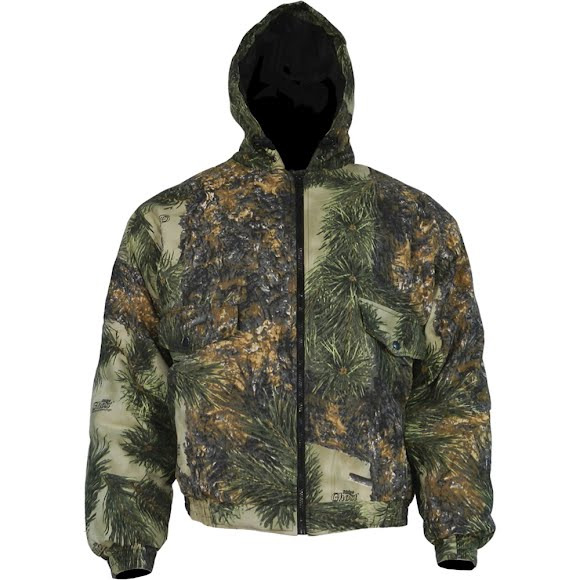 Stay warm and hidden on your next hunting adventure with help from World Famous Brushed Cotton Insulated Jacket. This jacket features front zipper closure as well as being hooded. Prairie Ghost® is the ultimate Western camouflage. It is designed for areas with lowgrowing vegetation and direct sunlight. Prairie Ghost® features muted natural colors, predominantly vertical lines, and distinctive prairie coloration. It is the ideal pattern for grassland, sage and desert hunts. Pull the vanishing game in conifer forests with Ridge Ghost®. Where underbrush is limited and sunlight varies from extremely bright areas to areas of shade and dark shadows, you need a completely different combination. Here, standing trees are often punctuated with deadfalls and new growth with vivid colors. Ridge Ghost® revolves around a linear pattern with soft browns and greens against an open natural background. Ridge Ghost® is equally at home on a mountain elk hunt or a pine plantation deer hunt.